Dozens more have been injured or arrested amid the protests against revisions proposed by President Daniel Ortega's government. MANAGUA, Nicaragua — Nicaraguan President Daniel Ortega repealed changes to the country's social security system Sunday night that triggered riots that led to the deaths of at least 26 people since Wednesday. The overhaul had sought to shore up Nicaragua's troubled social security system with a combination of reduced benefits and increased taxes. Human rights groups say at least 26 people have been killed in several days of clashes. Dozens of shops in Managua, the capital, have been looted. "The incidents of violence that have happened are regrettable," Ortega said in a televised message Sunday night, adding: "We cannot allow chaos, crime and looting. We cannot allow this." In one grainy, nighttime video, journalist Angel Gahona, clad in jeans and a blue shirt, holds up a cellphone and narrates as he approaches the facade of city hall in Bluefields, reporting live via Facebook on protests that have rocked the Central American nation for four days. Seconds later a gunshot rings out and Gahona slumps lifeless to the curb. Voices cry his name and someone presses a piece of cloth to his head to try to staunch the stream of blood. Another Bluefields reporter, Ileana Lacayo, confirms that he died before reaching the hospital. 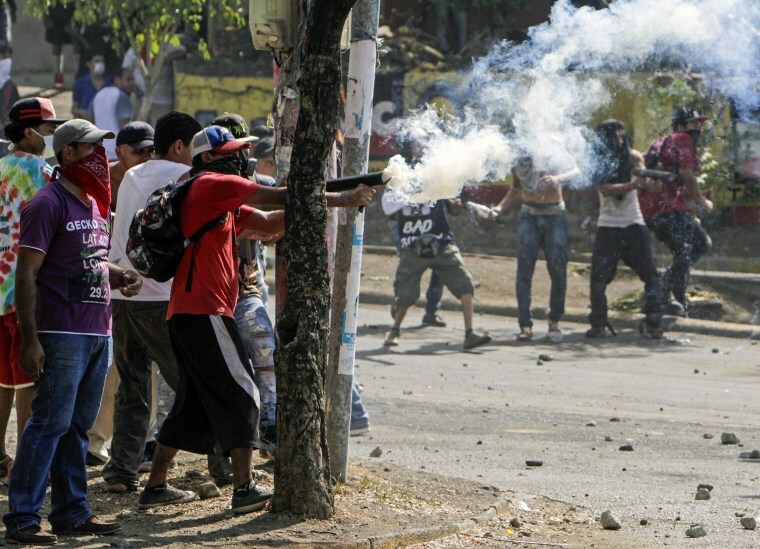 There were more clashes at the Polytechnical University of Nicaragua, one of the strongest bastions of the protesters. "We stand firm. They will not wear us out. Here we will give our all until the government understands that it will not continue to do whatever it pleases," Lombardo Ruiz Picado, a leader of the student protesters, told The Associated Press by phone from inside the school. In the morning, army troops were deployed to Esteli, a city north of Managua that has been a main flashpoint of the demonstrations, to help police repel protesters. State-affiliated media showed images of armed soldiers patrolling the city center and said they were safeguarding strategic concerns after fires at several public buildings. The Roman Catholic Conference of Bishops in Nicaragua condemned repression against protesters and urged the government to listen to them and drop the social security changes. "A unilateral decision always brings with it social instability. Rectifying decisions is a sign of humanity, listening is the path of reason, seeking peace at all cost is wisdom," the conference said in a statement. Heather Nauert, a spokeswoman for the U.S. State Department, said: "The United States government regrets the loss of life and injuries suffered in Nicaragua during protests by its citizens. We condemn the violence and the excessive force used by police and others against civilians who are exercising their constitutional right to freedom of expression and assembly."